People love connecting with like-minded individuals online. Its what has created the idea of the ‘social network’. There are thousands of new social networks popping up every day so they are getting more and more targeted. There are now a number of popular cannabis social networks that allow you to connect with fellow stoners, potheads, cannabis connoisseurs and like-minded individuals. Some of these 420 social networks are really cool and some not so much. They now even have dating apps for marijuana-lovers! In this article, I am going to show you all of the best 420-friendly social networks online for business and personal. The Forums at Grasscity is one of the oldest social media communities dedicated to everything weed. Originally, Grasscity was a very popular marijuana growing forum where users could chat about how-to grow, read grow guides and more.. but it has expanded into one of the largest marijuana social forums online. They have a number of different forums that you can chat with other marijuana-lovers about growing, smoking, legalization and more. Grasscity has even added a cannabis news section and a directory of dispensaries around the US. WeedLife is a new cannabis social network that is still a little buggy but has a large number of people signing up and joining daily. They feature a news feed style social media platform that features marijuana videos, businesses, education, products, growing info and more. This cannabis-based social media network still needs a lot of work but its one of the original social media platforms for marijuana smokers. If you are a business, brand or public figure you can create your own page where people can post on your wall, share photos, events and more. At Weedable, you can follow, post and shop, all right from this online platform. They have an app coming out soon that hopefully will help boost this cannabis social network to the next level. Enter your URL below to grow your traffic and revenue. Whether you are a business, personal, or just looking to connect with other pot users, then you can join Weedable and have your very own online profile. Here is our business profile on Weedable that allows us to connect with other businesses in the industry as well as keep our followers updated on all of the latest news. JointBuds is a newer cannabis social network that is dedicated to everything surrounded medical marijuana growing, usage, lifestyle and passion. They are still working out some kinks in their system and its still very buggy. Personally, we were not able to create an account because they are using an old version of captcha so it doesn’t work. I am not sure if this social media platform is still being managed or if they gave up on it but it’s still out there. Just like social media networks, marijuana-friendly dating apps have also started to pop up. 420singles.com is a dating platform that matches cannabis smokers locally and worldwide. Whether you are just looking for someone to smoke with or you are looking for a cannalover, 420 Singles can help you find other marijuana users in your area. The app is set up like Tinder where you can swipe left or right and make matches with other people on the app. You will need to download the app from the Google Play Store or the Apple App store for free. This cannabis social network is perfect for finding fellow weed smokers near you. Duby is now the largest community online dedicated to cannabis smoker, tokers and lovers. To sign up to Duby, you will need to download their app that’s available for App Store and Google Play. You currently cant create an account online but if you download the app you can start connecting with people right away. Duby is a mixture of Instagram, tinder and twitter all in one marijuana-friendly app. You can view top videos and they even have stories like Instagram. You can browse photos/users and either select ‘put out’ if you dont like it or ‘pass’ if you want to pass it on. They still have some work to do on making it a viable product that people will enjoy using but it seems to be getting some good traction as far as cannabis social networks go. High There is the tinder of marijuana users. 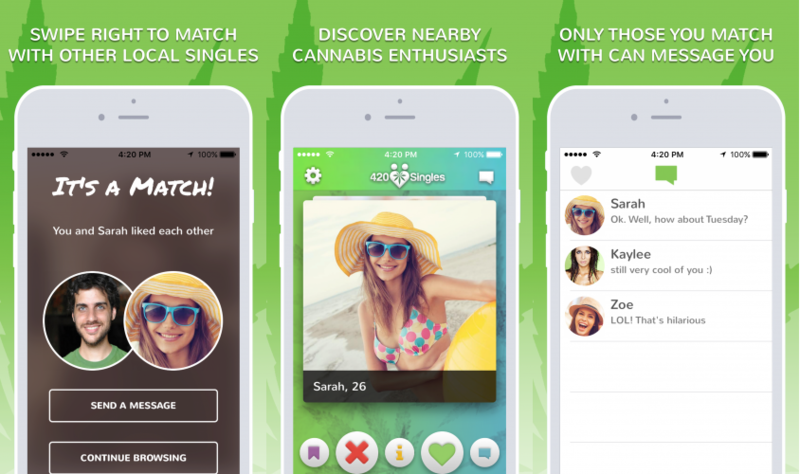 This cannabis social network is a dating app set up pretty much exactly like Tinder is. You swipe left or right on other cannabis users that you may be interested. Like Duby, High There is a cannabis social network that is only available on the Google Play and Apple App Store. It’s completely free to sign up and can connect you with other cannabis fans all around the world. Whether you are looking for friends or a relationship, High There can match you with other marijuana smokers. WeedCircles is somewhat of a mixture of Google Plus and Linkedin. You can connect with customers, colleagues and vendors who are all in the cannabis industry. This cannabis social network is free to sign up and includes thousands of marijuana businesses and a social network of marijuana users. If you are a business or marijuana company, you can add your details to WeedCircles and connect with fellow company owners and Cannapreneurs. WeedCircles is a part of the WeedLife network so you may find similar functionality on the two sites. If you have a marijuana group that you would like to grow, you can view and add your cannabis group to grow its exposure. With CannaSOS, you can explore strains, find products, reviews, friends, QA and more. If you are looking to join one of the larger cannabis social networks, then CannaSOS may be the one for you. They have a fastly growing following of marijuana users looking to connect online. You can ask questions about marijuana, cannabis or industry news and get a relevant answer from marijuana pros. Join groups and connect with other marijuana enthusiasts in niche specific topics. CannaSOS currently gets over 400,000 total visitors every month and they have a decent sized following on social media. One of their best features is their strain review database that has thousands of marijuana strains with detailed information about each strain, its effects, THC ratios and more. This website is a cannabis business social network and directory that is newer compared to the others. MJLink actually got $1.7M in funding in a Seed Round so they have some money to power this social network for canna-businesses. Not only is it a great place to add your marijuana business but you can also connect with other like-minded business individuals like yourself. It features news, friends activity feeds, products and even videos that are weed-friendly. They also own a couple of other similar types of sites like WeedLife and Hemp Talk. The Forums at the 420 magazine website are very active and a great place to connect with cannabis business owners. They have plenty of forums from how to grow marijuana to political discussions. There are thousands of active members, asking questions, connecting and networking online at the 420 Magazine Forums. Bud Hubz is kind of like Foursquare, but for weed. 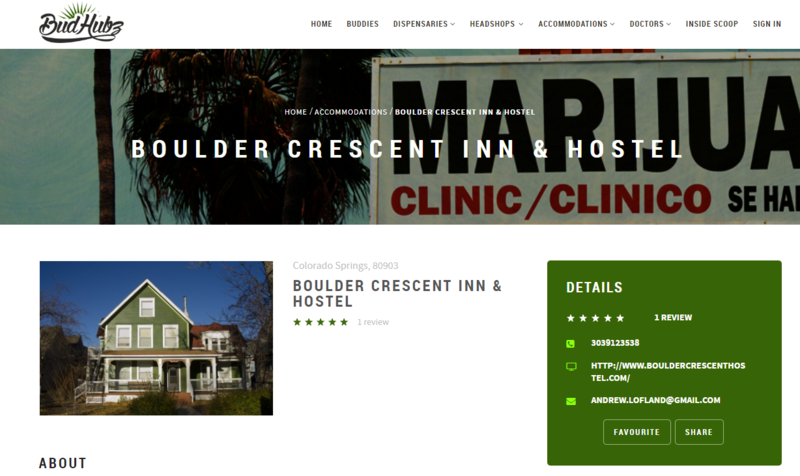 You can find the best dispensaries, headshops, accommodations and cannabis doctors online on their website. Its free to join and allows you to connect with ‘buddies’ or friends to get recommendations from the best marijuana shops around. It seems the site is still in a beta mode or development mode, but it could be a super cool social network for cannabis users. MJ Mary Jane is Pinterest for weed. You can pin cool weed photos, recipes, videos and more. They even have an app for google and apple so you can pin weed stuff on the go. Rate other pins, bookmark pins you like and follow other MJ pinners just like Pinterest. It’s completely free to sign up and you can find some really cool stuff on there if you look. This entry was posted in Marijuana Business. Bookmark the permalink. Tyler Horvath is a serial entrepreneur, digital marketing expert and King of Search Engine Optimization, with over 15 years experience building traffic online.